Hitters, we generally accept, are capable of controlling their balls in play (BIP) to some degree. They don’t have complete control — for example, BABIP is a much less reliable statistic than strikeout rate in the absence of huge samples — but when we see a batter with a high BABIP it’s less suspicious than it would be if that were a pitcher. 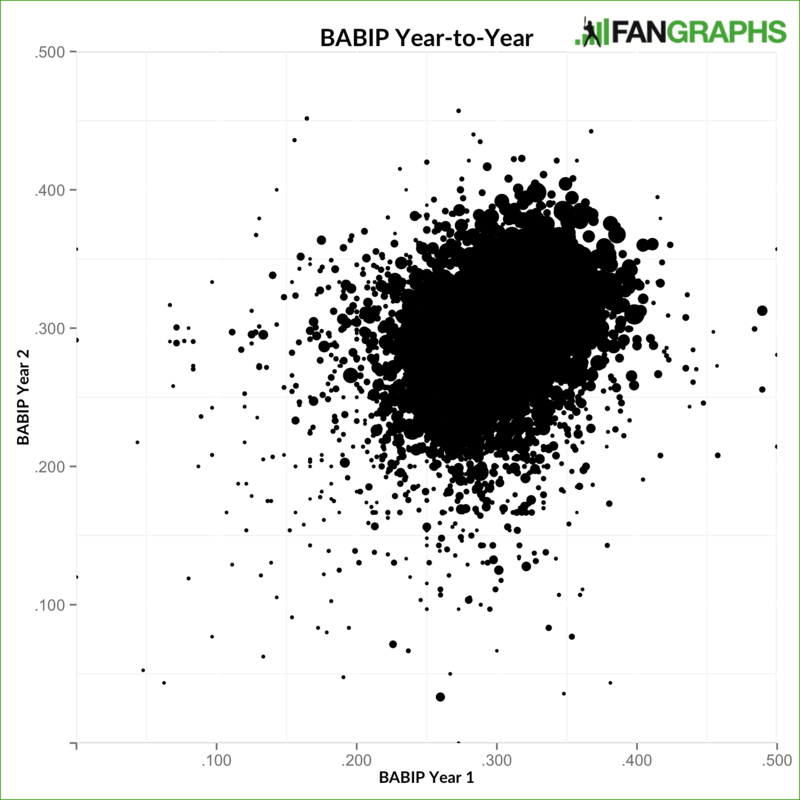 Interestingly enough, the year-to-year correlation for BABIP for hitters is quite low. The r-squared is just 0.08 (with 1 being a perfect 1:1 relationship and 0 being no relationship), even when weighting by the number of balls in play in both years. There isn’t quite a total lack of a relationship: the model’s p-value — that is, the measure of the probability that input variables have no effect on the output — is effectively 0, indicating that there almost certainly is a relationship. But knowing a hitter’s BABIP one year doesn’t tell us all that much about what it will be the next. I’ve always wondered, though, if batters have any ability to control things on a more granular level than this. For example, do hitters have a lot of influence over whether their ground balls turn into hits? Maybe something like BABIP on ground balls is pretty stable from year to year, and the rest of the hitter’s BABIP is just pure luck from his other kinds of batted balls. Or maybe the three are all separate skills over which the batters have a good degree of control, and the instability comes from a hitter having a down year in one category but a good year in the others. My hypothesis, though, isn’t really supported by the data. The year-to-year r-squared for each of BABOG, BAFB, and BALD is under 0.07; BALD is a mere 0.006. There is almost no stability in yearly BABOG, BAFB, or BALD numbers. But – and you probably know this because of the title – we’re not done. BABIP is only one way to gauge ball-in-play luck/skill/performance of any kind. 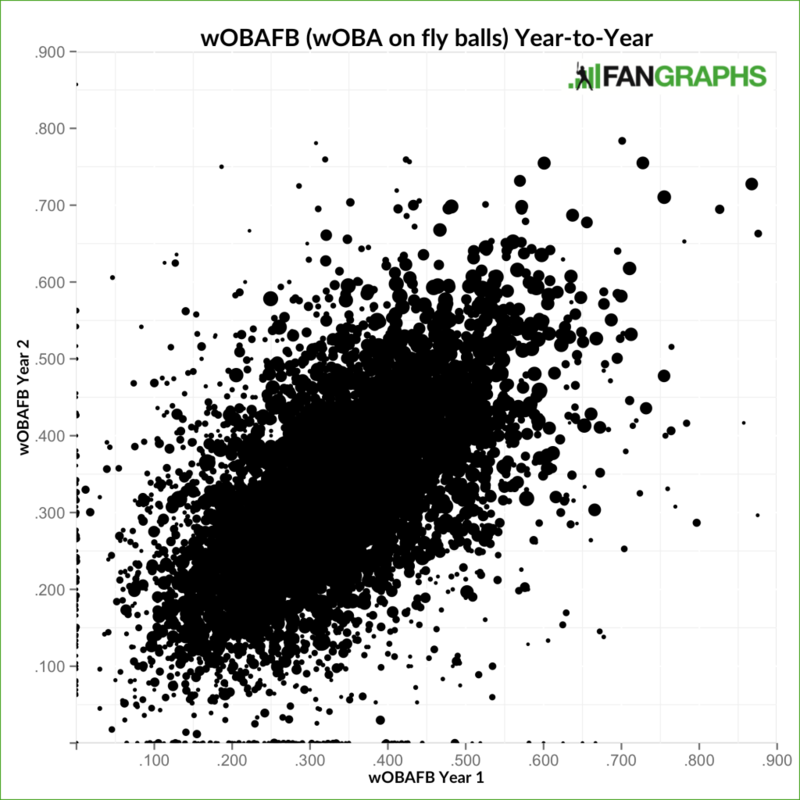 Another way, which I personally prefer, is wOBABIP — or, wOBA on balls in play. How does that correlate year-to-year? So here, where there is actually some semblance of a decent correlation, there might also be a relationship among individual batted ball types, unlike with BABIP — especially since BABIP doesn’t include home runs, which are a huge part of a hitter’s profile. For wOBABOG and wOBALD — the weighted versions of BABOG and BALD — the year-to-year correlation was just as low as the unweighted versions. But for wOBAFB, it was much, much higher. The r-squared was 0.345, a fairly large value considering the orders of magnitude of the other stats’ r-squared figures. This means that batters do have a good amount of control over whether their fly balls for hits, and how much damage those hits do. Hitters who have a high wOBAFB one year generally had similarly high wOBAFBs the next, further proving that this is a controllable statistic. 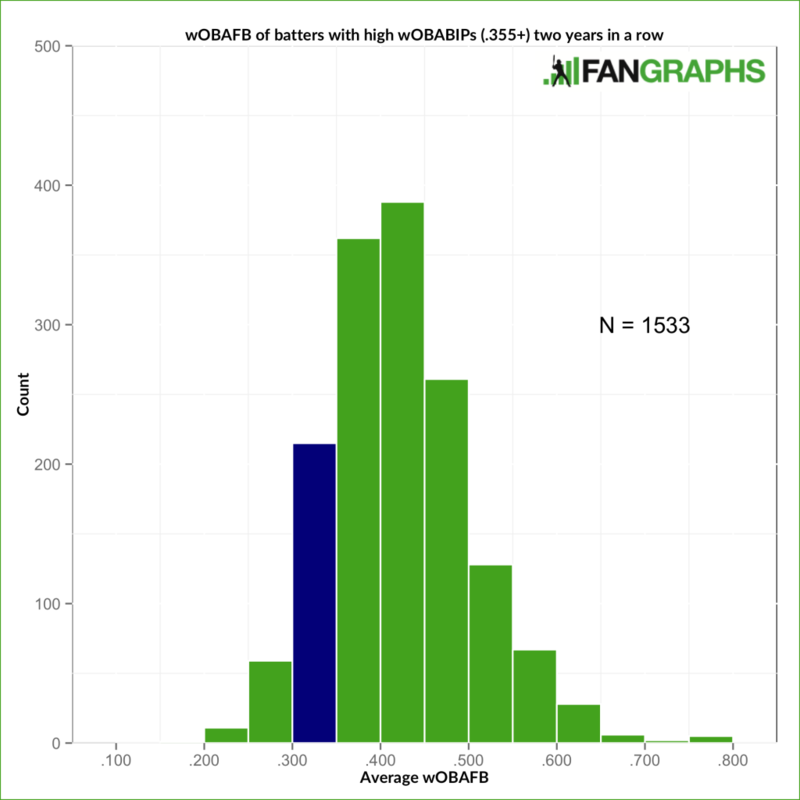 Among batters who had 100 balls in play in two consecutive years, those with a wOBAFB of at least .550 the first year (roughly 4% of the population; the league average is usually around .340) had an average wOBAFB the next year of .492. There are more players with an above average wOBABOG in the second year than there are those with below average. However, there are still a bunch of players who are below; there’s not quite the same effect as with wOBAFB. But this tells us nothing about how important wOBAFB is to overall production. 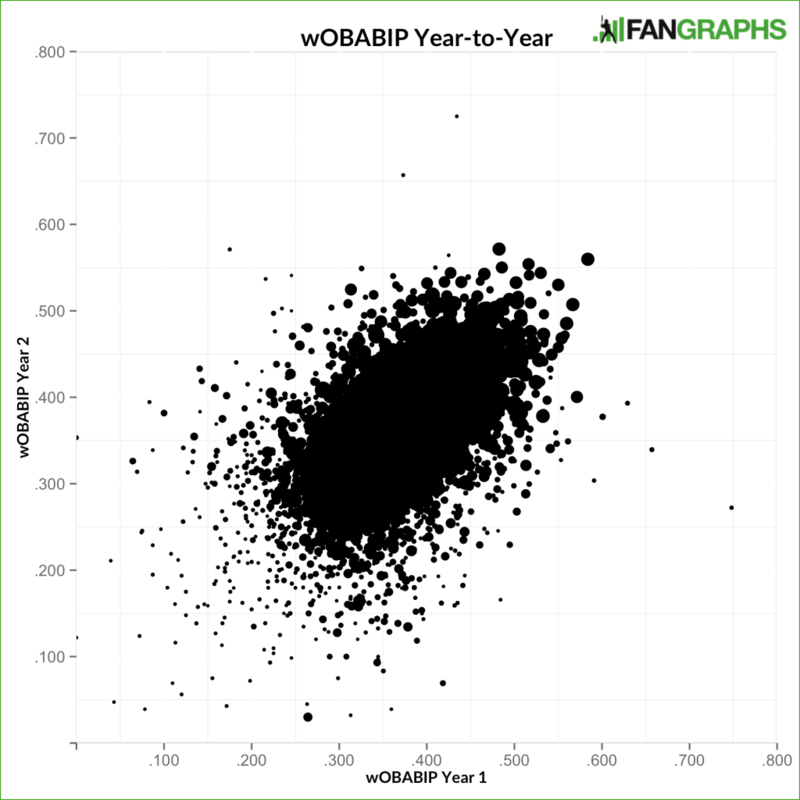 Obviously, to have a high wOBABIP, a low wOBAFB isn’t what you want. But can a player be a great hitter without getting a lot of production from his fly balls? The blue stack representing league average doesn’t even show up on this graph because it’s too low — every single one of the 97 players here has a wOBAFB higher than the league average. Granted, .450 is a pretty high bar to clear, and there are some hitters who have lower-but-still-good wOBABIPs and a low wOBAFB, right? The answer is yes, but not a lot. 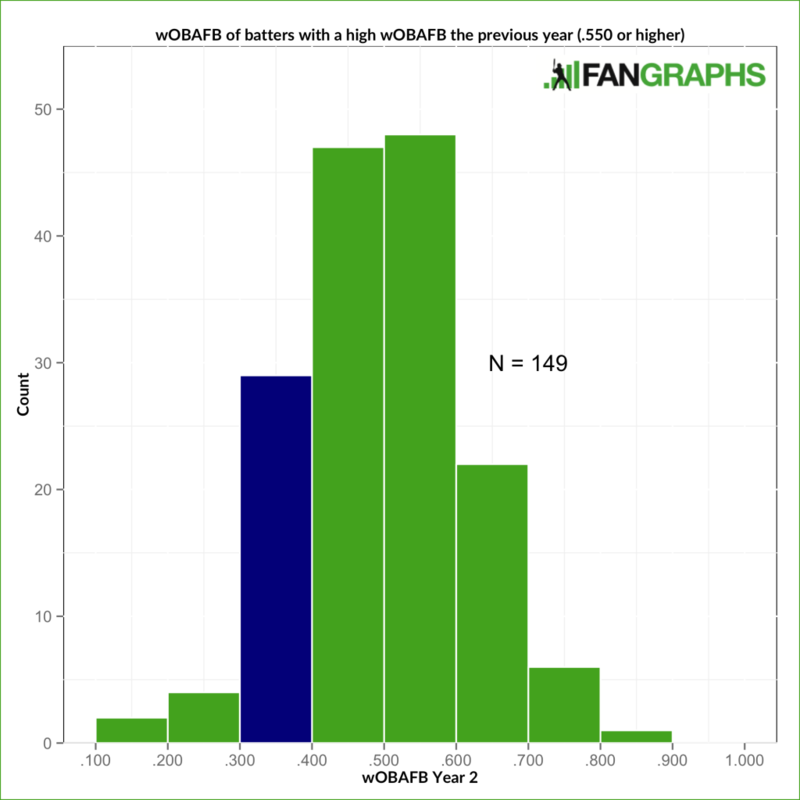 Here’s the same histogram, only with a minimum wOBABIP of .355 (more or less the league average) instead of .450. 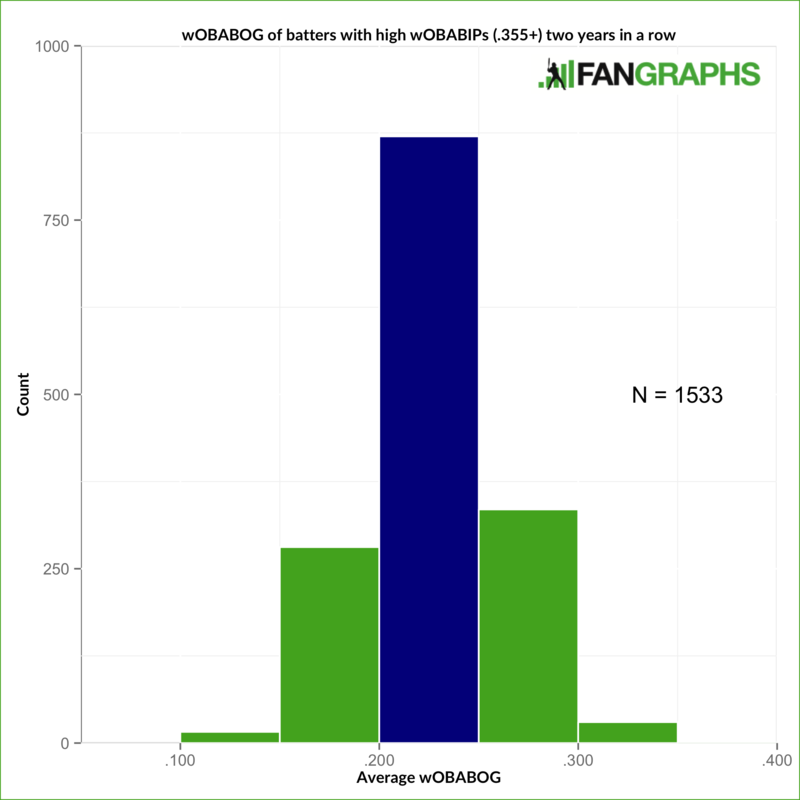 Nearly every batter with a good wOBABIP has a good wOBAFB, with few exceptions. The same cannot be said for wOBABOG. 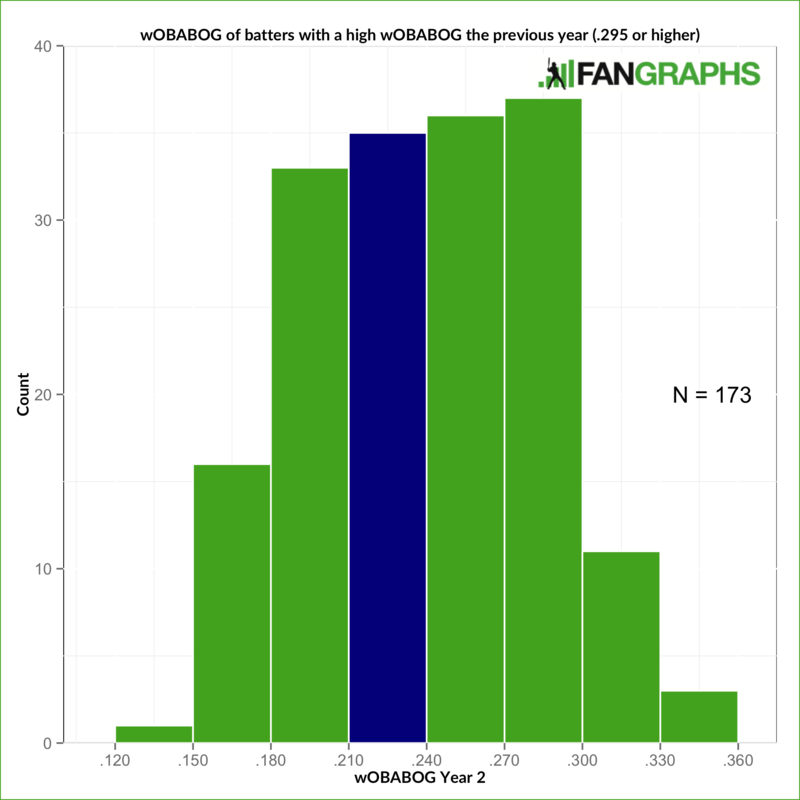 The highest stack in the histogram is the one that contains the league average wOBABOG (about .220). 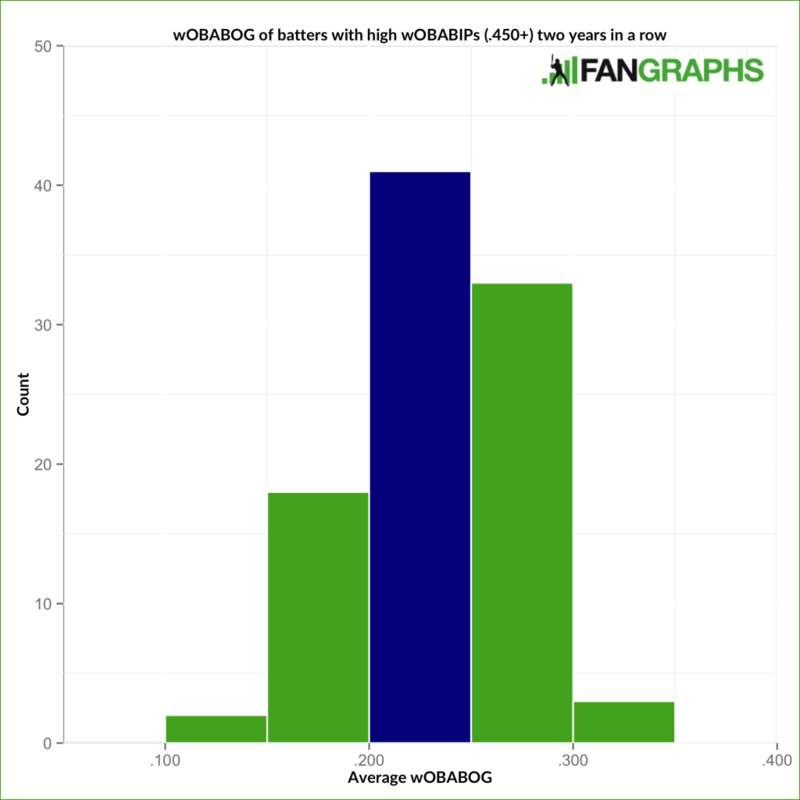 There are more hitters with an above-average wOBABOG than a below-average one, sure, but for the most part the wOBABOG of elite hitters is no better or worse than the average hitter’s. And when you lower the cutoff for the graph from “elite” to “good” like we just did with wOBAFB, what little skew there was almost completely vanishes. Really good hitters need to be productive on their fly balls. That can entail hitting home runs, recording extra-base hits that stay in the park (fly balls rarely turn into singles), or avoiding pop ups, but whatever their preferred method, they can’t get it done by slapping singles through the hole. (There are exceptions, of course — Tony Gwynn made himself a pretty nice career.) When you think about it, all the great hitters in the league have plenty of pop. Mike Trout, Bryce Harper, Miguel Cabrera, Joey Votto, and Giancarlo Stanton all have enough power to turn their fly balls into extra bases. There’s simply less damage to be done on ground balls as well. That’s why Jose Altuve, who now has two straight 200-hit seasons and is arguably the best contact hitter in the league, has never had a career wRC+ above 134 — lower than David Peralta’s wRC+ this year. 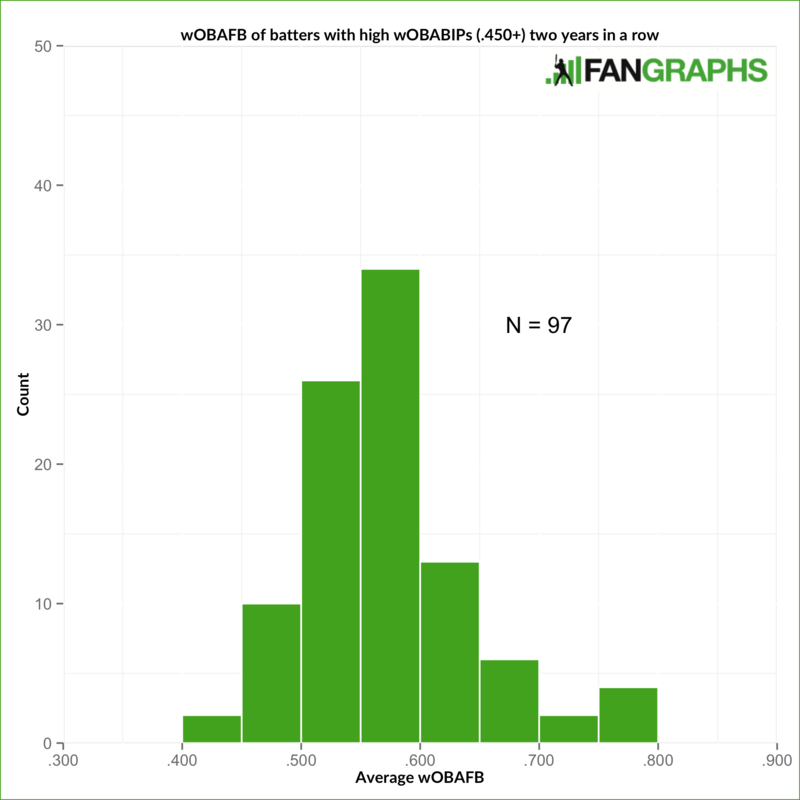 It’s why Xander Bogaerts, whose change in approach and the success it brought him turned some heads, only had a wRC+ of 109 this year, worse than Stephen Vogt. These players may have the ability to keep up high wOBABOGs thanks to their approaches — Altuve’s this season was .313, Bogaerts’s .299 — but it won’t turn them into elite hitters on the level of guys like Trout and Harper, and for most hitters it’s not a reliable way to produce. Of course, there are benefits to high-contact, high-average hitters. None of this is to say that there’s no use to those kinds of players; any team would be happy to have an Altuve or Bogaerts in their lineup. And, of course, a hitter can be good on ground balls and good on fly balls at the same time. But in order to be an elite hitter, the ability to get hits on grounders simply isn’t necessary. That same ability for fly balls, though, is crucial. We hoped you liked reading The Importance of Fly Balls for Hitters by Jonah Pemstein! This is excellent. I don’t suppose there’s any way to make wOBAFB available for individual players? Thanks! Yeah, probably not on the FanGraphs leaderboards or player pages, but I plan on writing an article containing that in it. Thanks, that data would be interesting to view. Interesting article.